At ExamOne, we’re preparing to celebrate Commitment Week March 7-11. To kick it off, we are proud to highlight some of our employees who have gone above and beyond with their commitment to our clients, applicants, peers and industry. 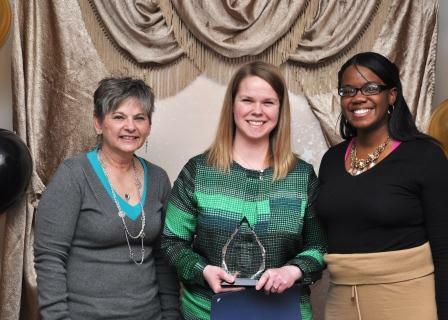 The 2015 ExamOne Midwest Region Employee of the Year was recently awarded to Kim Sohosky. Kim was nominated for her proactive approach in expanding her role to service one of ExamOne’s largest clients. When the Solutions Center team staffing was down three of six team members, Kim began to train new team members and took it upon herself to handle additional tasks in the meantime. Congratulations to Kim for being recognized for her extra efforts and positive attitude. We also regularly recognize other front-line employees regularly, like our Nurse Practitioner of the Month. ExamOne recently launched a new recognition program for our nurse practitioners who complete in-home health assessments for our health insurance clients and their members. Each month, we will highlight a nurse practitioner who has gone above and beyond. Kristian Reutlinger is the February ExamOne Nurse Practitioner of the Month. Kristian’s quick responsiveness and persistence with a member being screened through ExamOne’s MediCheck program calmed a critical situation. After recognizing a hypertensive crisis, Kristian called 911 and stayed while the member was assessed by EMTs. Kristian helped the member contact the primary care physician, resulting in admittance to the Emergency Room. We applaud Kristian’s actions and decision to stay and ensure this member received the necessary immediate care. Previous post: Is 100 the new 50? Next post: After more than a decade of decline, Center for Disease Control finds heart failure-related deaths increasing in the U.S.